Welcome to Culture Shock; The new series that named itself. Join us as we learn, grow and share all about new found social/cultural behaviours and expectations through our world exploration. These are our thoughts, observations and lessons on respecting and behaving in a foreign culture that may just leave you laughing and crying at the same time. In preparation for my journey abroad Karina wowed me with tales of dining on barbeque cockroaches in Cambodia, snacking on grasshoppers in Indonesia (which she reports, are pretty tasty), and even drinking snake blood in Vietnam. The most exotic meat I had ever tried in Canada was a single experience I had eating caribou and I never really adjusted to the gamy taste. My first experience with Taiwanese food didn’t happen until I actually set foot in Taiwan and while I had intended to jump in head first and immediately push beyond my comfort zone, some of the foods created too much shock value for me to just dive right in. Travelling to foreign lands requires that we explorers have a very adaptable pallet. Not only is food spiced differently the world abound but the variety of animals and animal parts used to prepare a dish will change drastically from one country to the next. In Canada I loved eating Thai, Vietnamese, Japanese and Chinese cuisine but these meals had been adapted to accommodate our western palate. Back home restaurant owners didn’t offer duck brain soup, intestine, hearts or tongue on the menu. At least, not in the restaurants I went to, but at the time I was leading a sheltered life! Now my eyes are wide open. I am sure that many of these items taste wonderful (otherwise, you wouldn’t see huge line ups at the local street vendor who scoops fleshy chunks into plastic bags for his customers), but I hesitate at the thought of trying them. It is all psychological. There are only certain parts of animals that I am accustom to eating based on the beliefs passed down to me by my family. 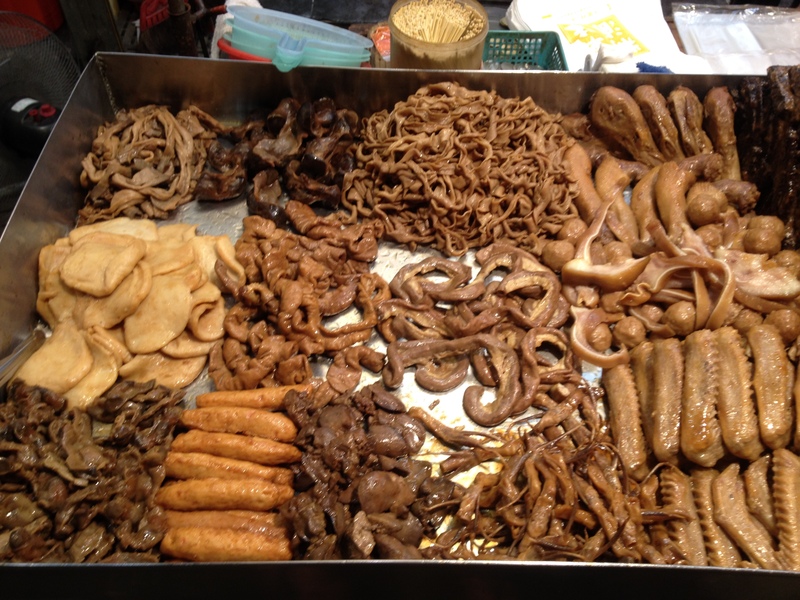 The animal parts which are considered food in Asia always went in the garbage in my household. 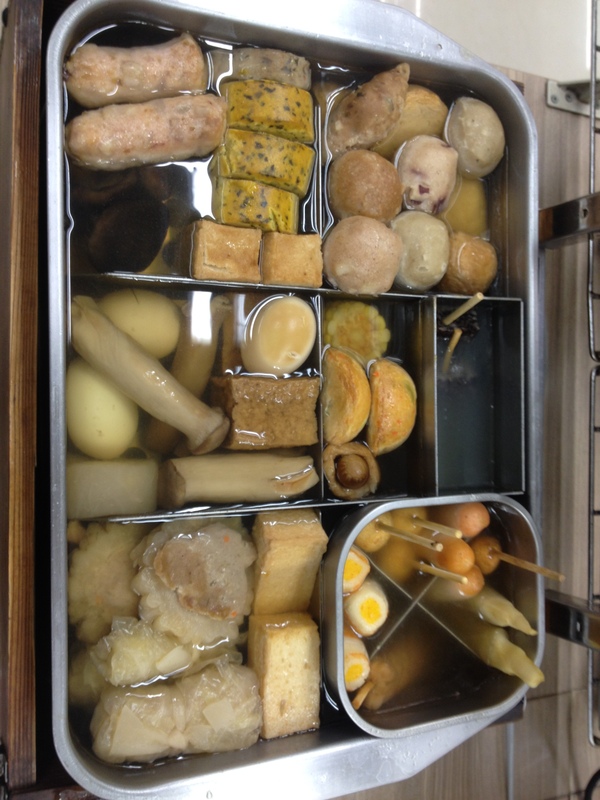 Since arriving in Taiwan I have tried foods with tastes and textures that dazzled our senses. We dined on wild boar that was hunted by an aborigine group in Taroko Gorge National Park. I ate a pancake made of turnip, a plethora of candies and drinks made from red bean, and a dozen vegetables that are completely new to me. 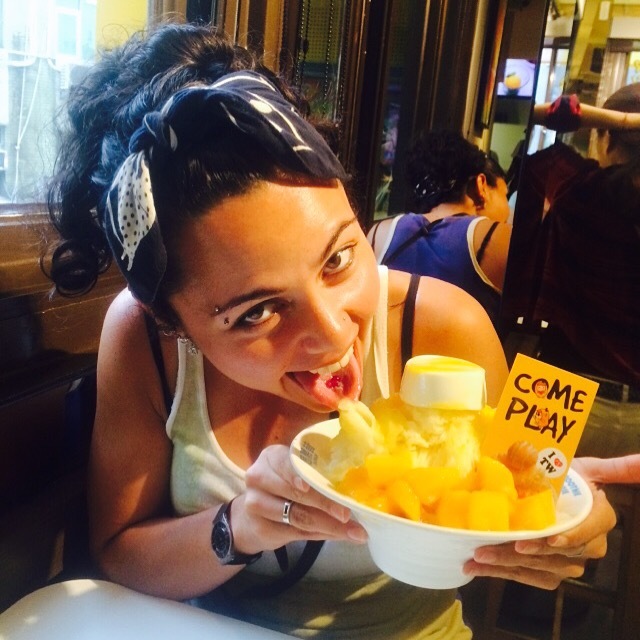 I discovered that my new favourite desert is a Taiwanese treat called Mango Ice, which without question, contains addictive properties that make consumers dream of it day and night. I have been bitten by the mango ice bug and now my life is forever changed. Karina told me once that travelling to Asia would make me fall in love with 7 Eleven. While in Canada we take these convenient stores for granted, being that they are scattered everywhere, in Asia they provide an easy avenue for westerners to have a taste of home. Sometimes you just NEED to eat something you recognize from home, even if that item is a candy bar, soda or bag of chips. Walking into my first Taiwanese 7 Eleven my investigation of the treat section revealed some familiar food with an Asian twist. Convenience stores are filled with fast foods I have never seen anywhere in North America. Various meats soaked in water that you can either get spicy or mild to suit the customers taste. Customers can also buy boiled eggs which have been soaked in black tea. At the recommendation of friends we met while hitchhiking through The Hundred Mountains of Taiwan, we stopped at a Family Mart (another popular convenient store chain), and purchased our first tea-soaked egg. They were actually, not half bad. Step One: Point to a word we can’t read in the menu. Step Two: Cross our fingers and hope for the best! In restaurants we give our local buddies cart blanch to order whatever they think we might like to try. They translate the menu and give us options here and there but mostly we just say, “order what YOU like.” Having someone recommend foods encourages us to make bolder choices as they help us feel more confident that we are weeding out the less appealing choices. Our Taiwanese friend Mike encouraged us to try fish eyeballs over dinner. He said Chinese superstition indicates this will improve our eyesight but he won’t eat them himself as he finds them disgusting. My grandmother always said eating carrots were good for your eyes but there is more than one way to skin a cat. For the record, I didn’t enjoy the texture much or the taste for that matter but just in case there is any truth to the superstition, I popped both eyeballs in my mouth, chewed and swallowed hard. I enjoyed watching his face cringe as I followed his late grandmother’s recommendation for developing healthy eyesight. Throughout our journey across the world I have typically cooked all our food so we could avoid paying restaurant prices but here in Asia, I have no idea where to begin. Meats are packaged differently and are only labeled in Chinese. When I wander about the produce section in a grocery store I have no idea what half the vegetables are. Our couch surfing host in Taipei city was kind enough to take me grocery shopping then she showed me how to make a traditional Taiwanese meal. I still have no idea the name of all the veggies used as she could only tell me the Chinese name (which I can’t even begin to pronounce correctly). Now I feel more comfortable taking the chance to grab something in a grocery store that I have never used before. The food is beginning to feel less foreign to me. Check out the first article in the Culture Shock! series: Culture Shock! and the Sorry Complex. Also, if you click on each photo there is a short description of what the foods are (the ones we were able to identify anyhow)! We were in Taipei six years ago and in 48 hours we will be back there! Can’t wait to eat Taiwanese food again! Thanks for reminding me about what I have sorely missed! Yes I can imagine that you have to have an open mind eating in Taiwan, that’s what is really is all about in that country – no way can you play it safe – duck part anyone? Awesome!! I’m a vegetarian so often I can’t try local specialties, but I can definitely still get out of my comfort zone. Great stories here! try stinky tofu. I am told by SOME, that its good. Other locals say its nasty. It stinks pretty bad but for some reason the taste is ok. I don’t understand how that works but hey, to each his own. Noooo F-ing way!! I am just not that adventurous. Anything that’s made of light beige meat with a curl or unexplained kink in it is OFF my list! Pass me the chips! We carry a jar of Nutella in our backpack for those days we don’t feel brave enough to hit the street markets.Not that jarred nut-goo is a safe alternative but it is familiar and sometimes you NEED the taste of familiar! This is why traveling to new places is so fascinating. There are always foods that we wouldn’t dream of eating at home that the locals have always eaten, and you can either choose to embrace it or reject it. Hopefully, as you’ve done, you embrace it and find some new favorites. In the west we waste so much of the animal that CAN actually be eaten. I met a couch surfer from Hong Kong who said he preferred eating the more interesting parts of the animal and he insisted that the parts that I would consider to be appealing (like breasts, legs and wings), are very boring. He loved to dine on chicken feet-this seems to be a popular treat on this side of the world. You can find chicken feet in bags at the convenient store. Yum Yum! I don´t eat much meat, so I was quite safe with the vegan dishes. In 5 months travelling around SE Asia I have tried so many different stuff that I have no clue what they were or how they called them. But I think that is the adventurous part of travelling and eating abroad. Did you end up eating at expensive restaurants in order to ensure that you were eating a vegan meal? The best part of traveling is exploring the culinary culture of the destination you’re visiting. You certainly were very adventurous to try the fish eyeballs. I’ve heard they dissolve in your mouth. I guess I’ll have to try them myself on a visit. The fish eyeballs were rather chewy. I would have preferred it if they just dissolved quickly. I find I can adjust to different tastes of foods easily…it’s the texture that throws me off.